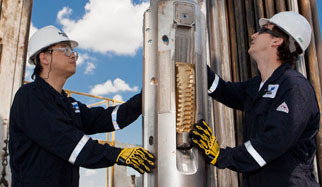 Baker Hughes Incorporated has posted Weekly Rig Count reports to its Investor Relations website. BHI Rig Count: US +8 to 941 rigs. US Rig Count is up 8 rigs from last week to 941, with oil rigs up 11 to 758, gas rigs down 3 to 183. US Rig Count is up 520 rigs from last year’s count of 421, with oil rigs up 428, gas rigs up 93, and miscellaneous rigs down 1 to 0. The US Offshore Rig Count is unchanged from last week at 22 and up 1 rig year over year. Canadian Rig Count is up 11 rigs from last week to 170, with oil rigs up 7 to 98 and gas rigs up 4 to 72. Canadian Rig Count is up 94 rigs from last year’s count of 76, with oil rigs up 62, gas rigs up 33, and miscellaneous rigs down 1 to 0.